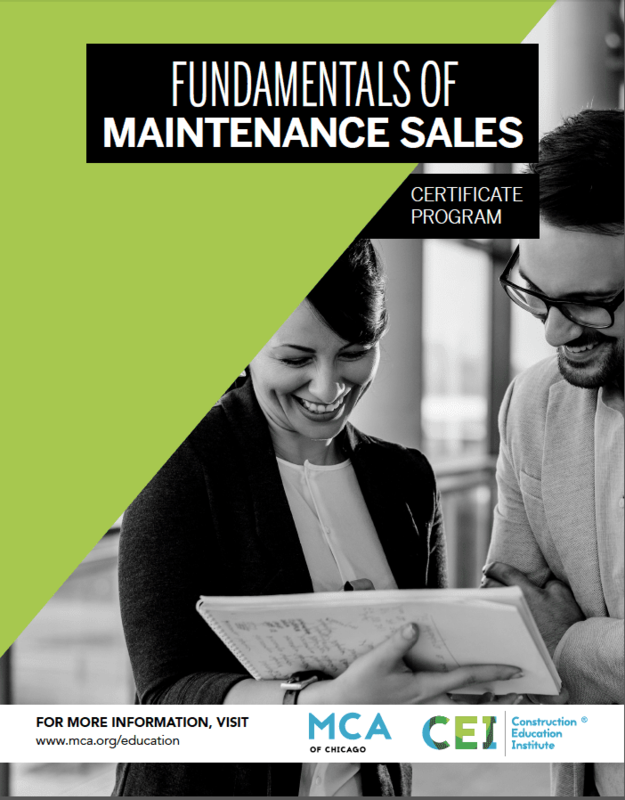 MCA of Chicago provides unparalleled educational offerings for its members, including the Fundamentals of Maintenance Sales Certificate Program. This program is structured to deliver practical, proven lessons on how to succeed in selling HVAC/R Preventive Maintenance Agreements, while being respectful of the demands of the sales professional’s work schedule. The core curriculum training consists of four 4-hour sessions spaced two weeks apart. Two required supplemental courses in Public Speaking and Business Writing are offered after the core training concludes. Program participants then choose any four of nine brief elective courses on various topics relevant to maintenance sales. Prior to beginning the core curriculum training, the program participants and their managers are required to attend a “Coaching for Success” Huddle. Having successfully completed all the above instruction, graduates of the program will be presented with their certificates of completion at MCA of Chicago’s spring membership meeting. Registration for this course is now full. We start with a critical examination of the importance of Maintenance Agreement sales to your service organization,then identify the skill set necessary to be successful selling Maintenance Agreements. The key metrics that every sales professional should use to measure performance will be taught, along with sales plan design and tracking. We will explore the sales cycle that is used to determine progress with each sales opportunity, and the larger selling system. The highlight of this session is learning how to qualify prospects and conduct the initial face-to-face meeting. This will include interactive practice, as qualifying prospects is arguably one of the most important skills necessary to make effective use of one’s time and resources. Closing strategies and techniques will be covered, along with how to follow-up after a presentation, and how not to. Discussion will include the power of a “proposal take back”. We will identify the sales situations appropriate for consultative selling versus feature-benefit selling. We will look at a day-in-the-life of a successful Maintenance Agreement sales professional, and the pitfalls that keep others from reaching their full potential. Our final discussion will be on continued career development, personal development and industry participation.